Cherry Road School was once part of farmland owned by Willis Parsons and other local farmers. During the 1920’s, Willis’s daughter, Marion Parsons, at the urging of the then small farming community, launched what is today Cherry Road School in an old chicken coop adjacent to her father’s cherry orchard. Children who lived in the farming community known today as Westvale during the mid to late 1800s and into the early 1900s, attended a one-room schoolhouse on Terry Road. In the late 1800s, Marion Parsons and her sisters, Martha and Grace, were enrolled in the Terry Road School (Geddes School District I). Others who attended at this time included their cousins Guy and Herbert Parsons, George Jerome, and other local farm children, Mable and Roy Vinton, Will and Hazel Andrews, and Louise Hubbell. This school was originally built in 1847. It had no running water, and a box stove kept the children warm in the wintertime. There was an outhouse in the back of the school. When it was time for class to begin, the teacher rang a large brass bell. (Hill & Vale, January, 1974) The land for the Terry Road School had been donated by the Guy Parsons family. When Marion graduated from Terry Road School, she went on to study at Cortland State Teachers College. When she returned home to the Parsons Farm—the farmhouse still sits today on the corner of West Genesee Street and Parsons Drive—the farm community was in need of a new teacher and a new school. Marion enlisted the help of the women picking fruit in her father’s cherry orchard to help her clean up the chicken coop that would serve as a temporary school. The brass bell from the old school came with her, and for many years, the bell was used to summon students to school and back to their desks after recess. The bell resides today at Cherry Road School in Principal Sarah VanLiew’s office. 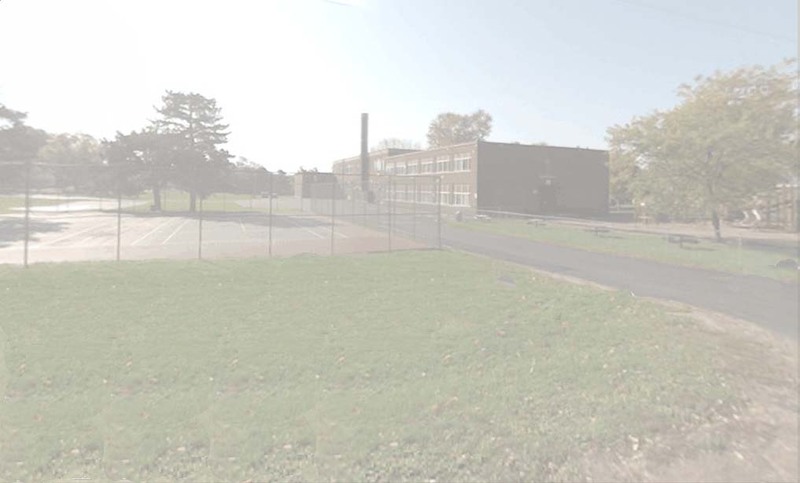 But times were changing, the Industrial Age emerging, and as the city of Syracuse grew and sprawled, engulfing the surrounding farmland, the needs of the Cherry Road School students began to change too. In 1938, the school graduated its last farmer. From then on, Cherry Road students went on to become lawyers and doctors and professors. But they never forgot Miss Parsons, and every year at Christmas time, or on her birthday, until her death in 1972, she received many cards and letters from former students. They would tell her what an important role she and Cherry Road School had played in their lives. By the example she set, and through the impact she had on so many lives, Marion taught others what it meant to be a teacher. But there is more to the story than one woman and the school. The same people who remembered Miss Parsons fondly remembered something special about the community around the school. Those memories are part of a rich heritage that will be collected and shared through the Cherry Road School Project.One hundred years ago, there were many farms in the area. Ned Jerome and Henry Jerome were the original co-owners of the last working farm, Jerome Dairy. Many will remember Van Jerome, Jim Jerome (James S.) and Clayton Burritt, their delivery vehicles a familiar sight as they delivered fresh milk every day to the residents of Westvale. In the olden days, instead of the truck, they peddled milk with a horse and wagon and ladled out milk to customers from a milk can. Later they used a Packard auto, before they got the milk trucks. For many years, the people of Westvale enjoyed the daily convenience of the glass jars of fresh milk left right in their kitchens or pantries through the two-sided milk doors that many of us probably took for granted. Many of these families and many of the students who attended Cherry Road School, and whose grandparents sat on the hard wooden benches at Terry Road School, still reside today in the Westvale community. Though the nature and the industry of the area has changed from the olden days, many of the people remain rooted in the community. Many remember Miss Parsons fondly, many remember the sound of the brass bell. To them, that clanging sound means more than the start of class. It calls to mind community.